← Homebrew Wednesday 38: All this in an NYC apartment? Click to view video version of this post. For this week’s Homebrew Wednesday update I’ve chosen to switch things up in two ways. The first is giving both homebrewing and craft beer updates because as you may have realized I’ve been trying to bring back more craft beer posts to thebrewedpalate.com. Secondly, though I’ve posted a video version of this HBW on my YouTube channel, I’ve chosen to type it out here in order to save all who don’t want or have time to watch a 15 minute some time. So for all intensive purposes this post serves more as a general The Brewed Palate update than a sharing of homebrewing information. Seven Blessings Imperial Rye Saison w/ Brett Brux and dried apricots – After a little over 2 months the apricots remain at the top of the carboy and should begin to descend over the next month or so. Liquid Sustenance “Farmhouse Pale Ale” – i.e. a Saison with American hops and a mostly APA grain bill fermented with The Yeast Bay’s Saison Blend…This past Monday I dry hopped it with 1.5oz of Galaxy and 1oz of Ahtanum hops. I plan on bottling it this coming Monday or Tuesday (10/6 or 7/14). Mosaic Wet Hopped IPA – This beer is fermenting well over the past week and a half and will either left in primary for another week and a half i.e. a 3 week primary or transferred to a secondary fermenter to clear etc. at the 2 week mark. The blow off jar is smelling so awesome that I’ve been having my wife and friends smell it in order to have them join in on the excitement surrounding my first wet hopped IPA. Lion’s Roar Pilsner – After lagering for 4 weeks my Firestone Walker Pivo Pils inspired pilsner is tasting great and I’ve begun slowly carbonating it at 11 PSI. I chose to slowly carbonate it because I won’t be home this weekend and therefore can afford to wait to sample it. I’ll definitely be sending some to brewmaster Matt Brynildson once it’s ready. Interborough Brown Ale (Oatmeal Brown Ale) – Since tapping this keg I’ve been puzzled by how little this beer tastes like a brown ale in that its flavor profile is more like a creamy and malty ale than a nutty/roasty brown ale. As such, next time I brew it I am going to up the dark malts and also cold steep them to get a smooth roasty espresso flavor…In order to check how much beer was left in the keg I took it out of my keezer for a few minutes so that a condensation line could form and to my surprise I still had about half a keg left. As a result I began calling some friend and telling them to stop by for a pint ASAP. Though if I don’t finish the keg before my IPA is ready I’ll either bottle the rest or fill my growlers and bring them to homebrew club meetings etc. Before getting into my craft beer related updates I’d like to plug a few homebrewing and craft beer magazines. Zymurgy (published by the American Homebrewers Association) and Brew Your Own are both great resources for homebrewing recipes, tips, and news. Next, All About About beer magazine does a great job covering craft beer news from all over the US and international beer scenes with well written in depth articles. This past Monday I unfortunately had to swap out my CO2 tank because I lost an almost full tank due to an unforeseen leak. After doing so I headed to Whole Foods on 59th Street (Columbus Circle) which has both a retail beer section and a bar that offers 10 beers on tap, bottles to drink there or to take home, and growlers. While there I first grabbed a bottle of Almanac Beer Co. India Pale Ale and a couple of Firestone Walker’s 2014 vintage of Velvet Merkin and then headed to the bar to ask if they had any of Almanac’s sour beers. Luckily they had their Cerise Sour Blonde, Dark Pumpkin Sour, and Heirloom Pumpkin Barleywine. I opted for 2 bottles of the Cerise Sour Blonde because the bottles were $11 each and I’m not a big pumpkin ale fan. While at the bar I first enjoyed a pint of Green Flash’s West Coast IPA (now a double IPA) and then after striking up a conversation with a fellow bar patron I split a bottle of The Commons Brewery’s Urban Farmhouse and discovered that their farmhouse/saison also gives off a touch of sulfur and that my picking up sulfur in my saisons isn’t as big of an issue as I’ve made it out to be. 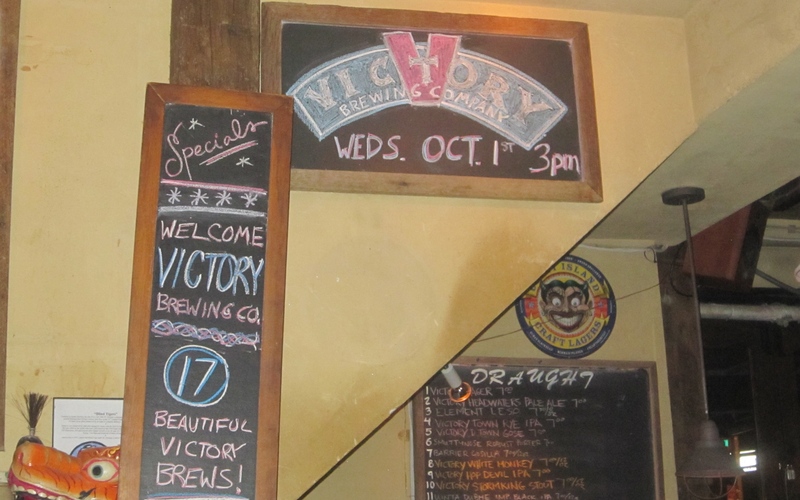 My second and final craft beer adventure of the week was to yet another brewery tap takeover event at Blind Tiger Ale House where 17 of Victory Brewing Company’s beers were on tap. Because I got there close to sundown I made sure to ask Victory’s founder and brewmaster Bill Covaleski for an interview right away and thankfully we were able to film it before we lost the daylight. After a great interview we headed back inside and I started the evening with Firestone Walker’s Agrestic Ale (yes I know I was at a Victory event). It had a complex sourness and funk to it all while being refreshing. I hope I get the opportunity to try it again. I then moved on to Victory’s Hop Ticket #4 Noble IPA on cask, while it was quite cloudy from being jostled in transit, the beer tasted quite good and the hop character was surprisely close that of an American IPA despite being brewed exclusively with German noble hops (Tettnang Tettnang, Tettnang Hallertau, and Spalt Hallertau). For my third I ask Bill and some of the BT regulars for suggestions because this beer was beer #1600 for me and I wanted it be a memorable experience. I ended up choosing D’town Draft Rye IPA, as a lover of beers that are brewed with a hint of rye (IPAs, Saisons, etc.) this beer brought bready rye and assertive citrusy and tropical fruit notes from Mosaic hops upfront with a spicy and floral moderately bitter finish. All in all a beer that was worth of being #1600. It was then time for a night cap and I chose Victory’s Storm King imperial stout. Like Great Divide’s Yeti and Flying Dog’s Gonzo, Storm King is one of my go to night caps because of its balance of bold hop character and style specific chocolate, espresso, dark fruit, and roasted malt flavors. Having not had this beer on tap in a long time I forgot how drinkable it was for a 9.1% ABV beer. In the end I was able to savor it and still make it home at a reasonable time. In my next blog post: My interview with Victory Brewing Co. founder and brewmaster Bill Covaleski. This entry was posted in Uncategorized and tagged all grain homebrewing, Almanac Cerise, Blind Tiger Ale House, Firestone Walker Agrestic Ale, homebrew wednesday, victory brewing company, whole foods beer. Bookmark the permalink.